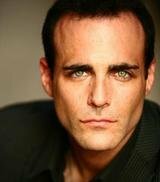 Brian Keith Bloom (born June 30, 1970) is an American actor, voice actor, and screenwriter. Bloom’s recent work has been a series of commercials for the 2009 Cadillac Escalade Hybrid, directed by filmmaker Joe Carnahan, the voice of Alex Shepherd in Silent Hill: Homecoming and Kane in Kane & Lynch: Dead Men and its sequel Kane & Lynch 2: Dog Days (among many other notable video games) the role of fanatical cult leader Jonas Sparrow in the Joss Whedon show Dollhouse, and the voice of Jackie Estacado in The Darkness II. He is presently cast in a number of voice over parts, both in video games as well as direct-to-video projects. Bloom continues his working relationship with Carnahan, playing private mercenary bad guy “Pike” in the 2010 movie The A-Team, which Bloom also co-wrote with Carnahan, who directed the 20th Century Fox feature based on the popular television series. He is the voice of Captain Ryan in Space Heroes, Leonardo’s favorite show in the 2012 Nickelodeon TV series.